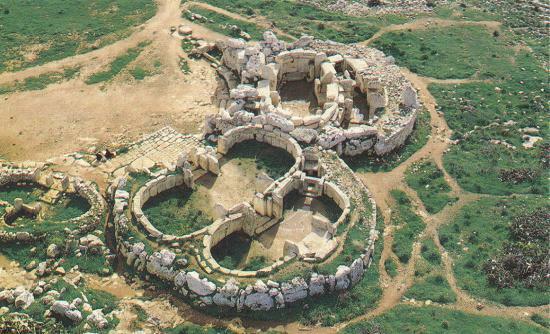 The Mnajdra temple complex was built on the south west of the island, overlooking the sea and the nearby island of Filitosa. 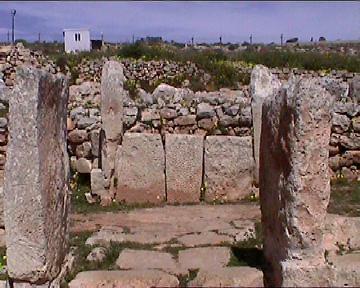 The proximity of Mnajdra with the nearby Hagar Qim exemplifies the theory of twinned Maltese temples. 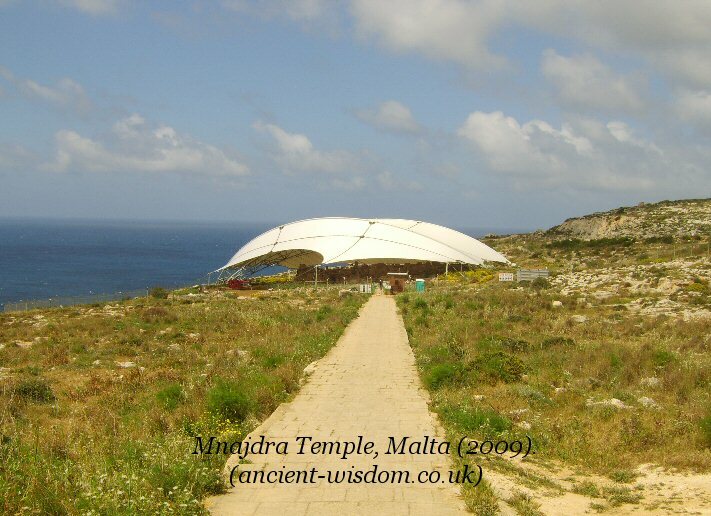 Today, the temple is covered over in a Maltese initiative to protect the monuments. 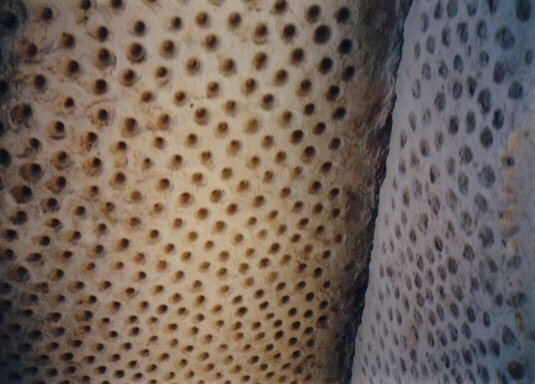 The face of the future...? 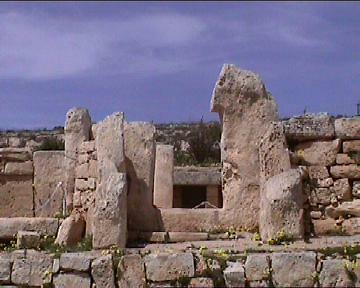 Mnajdra before it was covered, the temples were connected with the landscape, with the sea, sky and its partner temple visible on the horizon. 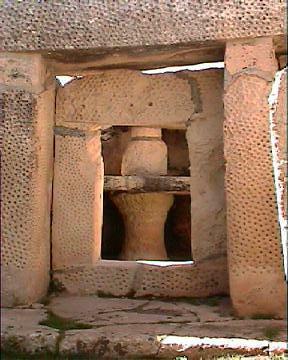 Although a great deal of this temple has been restored and replicated, the larger stones are still original. 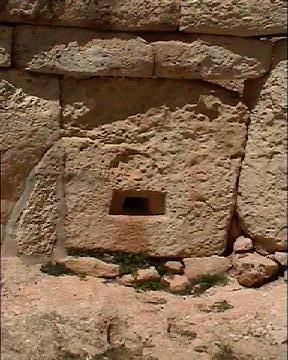 The standard 'Hitching-point' at the entrances of most Maltese temples. 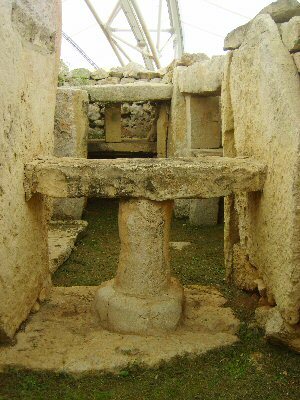 The same features were also used to hold the internal doors of the temples, and perhaps more importantly, as boat moorings. 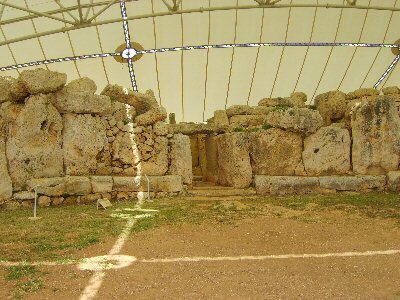 The photo (left) is from the ground in front on Mnajdra, while that on the right is from St Georges bay, the site of several other important Neolithic remains. 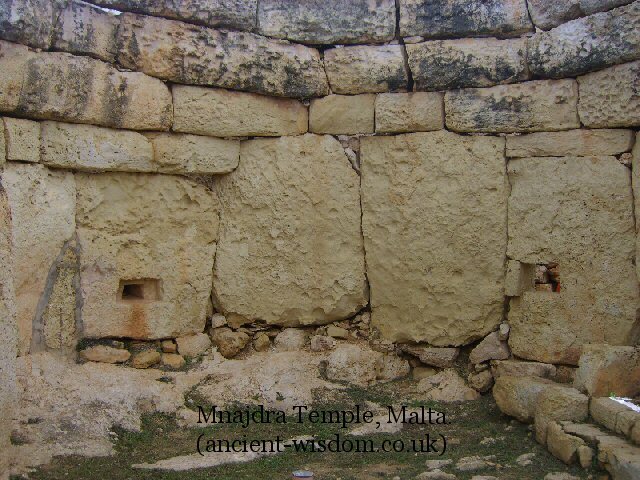 Classic temple walls, curved inwards, as at Hal Tarxien. 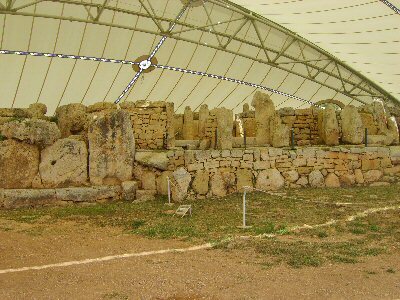 It is proposed that the temples were originally completely covered over with roofs, an idea supported by inwards curve of the walls and the following engraving, also from Mnajdra. 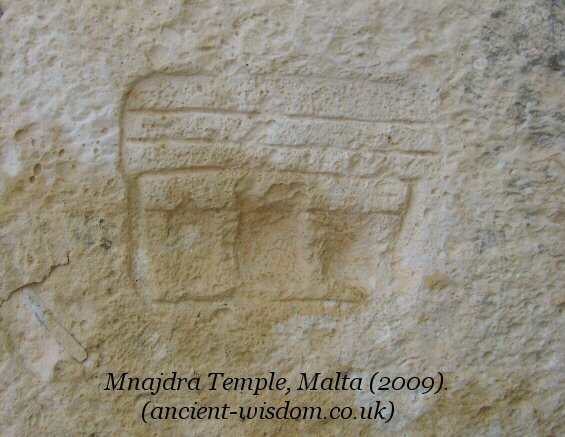 This engraving from the upper temple corridor wall is of a temple facade. 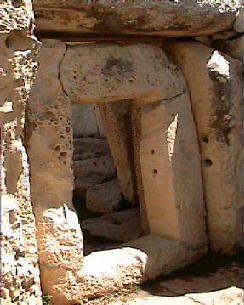 The style is similar to that of other model temples found at Hal-Tarxien and Skorba. 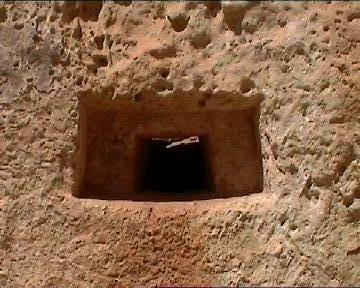 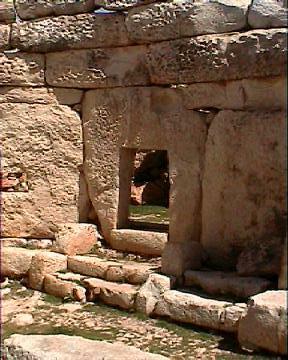 The temple has some of the best examples of 'Stone-cut doors'. 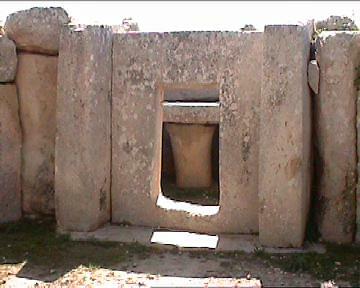 Plus this beautifully carved 'oracle hole' in the wall - (Note the presence of natural gaps between the stones of the wall - photo left). 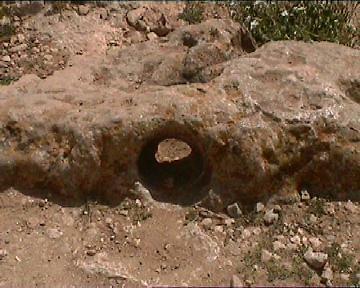 The hole is carved so that on the side which 'receives' the blocking stone the hole is smaller, less prominent and lower down to the floor. 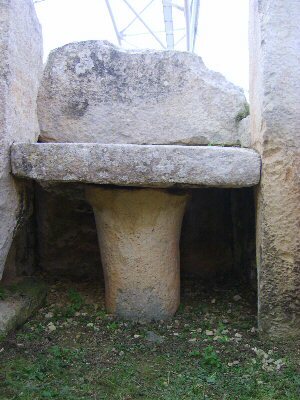 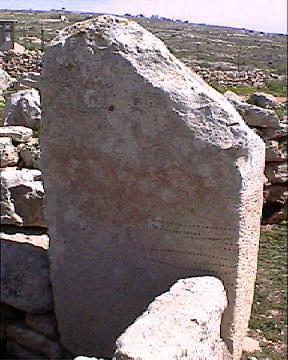 The marks on these stones are a common feature in several Maltese temples. 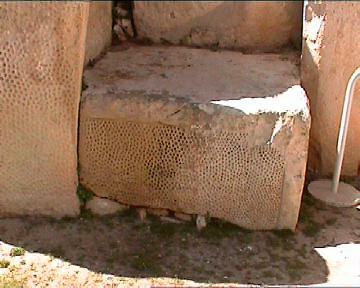 A close inspection of the following photograph from the lower temple illustrates that the holes were 'drilled' and not just randomly punched as one might assume. 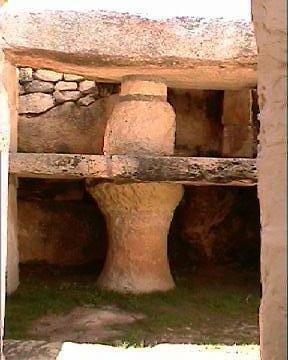 These stone features, commonly called 'mushroom' alters, etc.. are more likely to be structural supports. 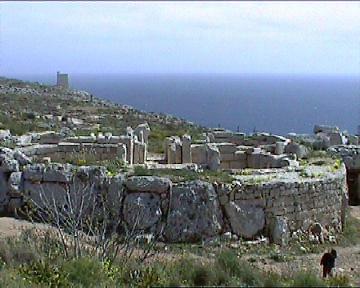 The view of Filfla Island from Mnajdra (and Hagar Qim). 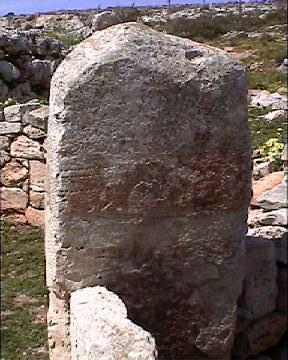 Hancock also makes reference to 'Father Emmanuel Magri, the first official excavator of the Hypogeum at Hal Safleni', who 'recorded the presence, up until the end of the nineteenth century of cart-ruts on the tiny uninhabited island of Filfla', a small island about 5 km south of Mnajdra and Hagar Qim temples. 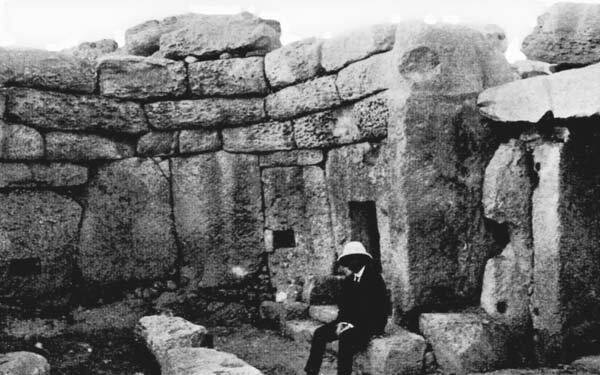 He then adds that in 1912, R. N. bradley commented on cart ruts near Hagar Qim - noting that they ran "over the precipitous edge of the cliff towards Filfla" (2). 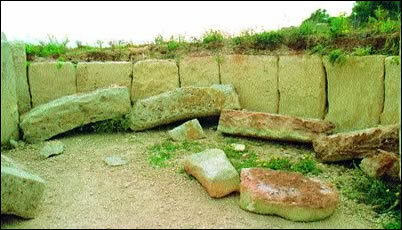 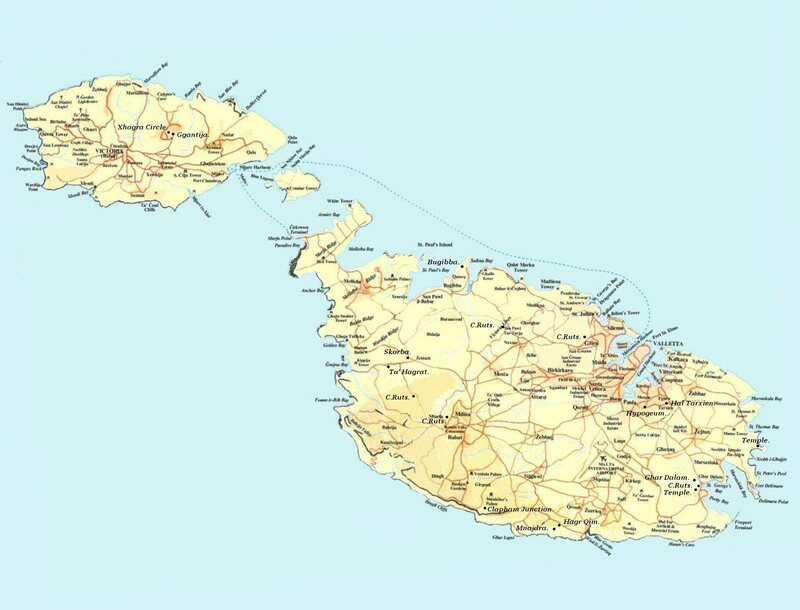 The conclusion of this information is that cart-ruts once ran all the way from Hagar Qim to Filfla across a land bridge, which has collapsed since humans first came to the island. 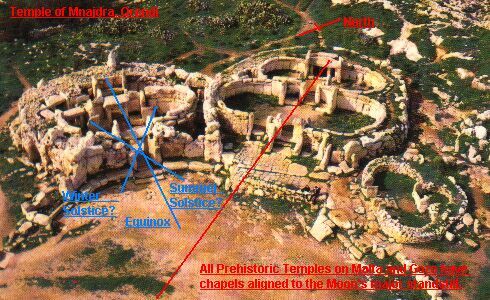 This picture demonstrates how several different astronomical orientations were built into the design of the temples. 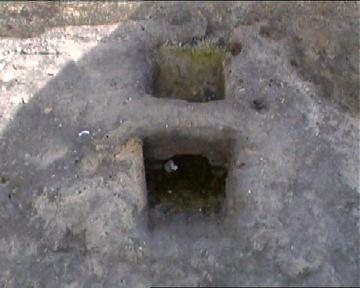 A Winter solstice alignment combined with the 'count-marks' on the posts on either side of this small chamber suggest an astronomical function. 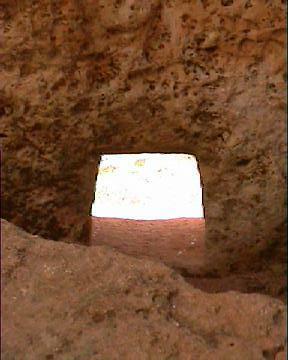 Photo taken after the desecration of the site on 'Good' Friday in 2001.